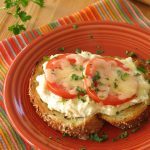 Creamy Open-Faced Tuna Melt Sandwiches transform creamy, cheesy tuna dip into an ultimate comfort dinner when slathered on bread, topped with fresh tomato slices and cheddar cheese and then broiled in the oven. 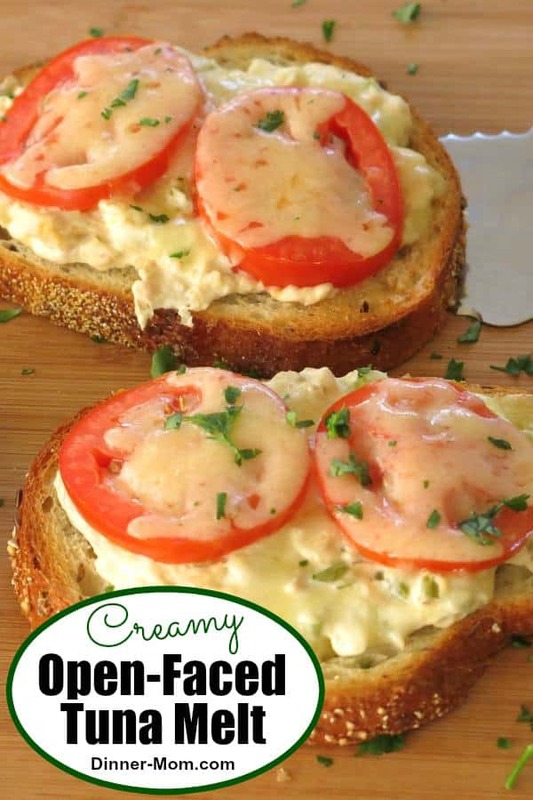 If you’re a fan of cheesy dips, then this creamy open-faced tuna melt sandwich is for you…even if you’re not a raving fan of tuna…and, especially if other members of your family love tuna. Because…tuna can be a source of disagreement. I know. Confession time. I’m not in the hater camp, but I’m not a really big fan of tuna. My hubby and darling daughter are. They could go for weeks eating tuna fish sandwiches for lunch. I shy away from even opening and draining a can. The difference between their sandwiches and this creamy hot sandwich (which I truly DO enjoy) is the addition of cream cheese, fresh tomato slices, and cheddar cheese and it’s broiled. It’s an upgrade to a basic tuna melt that tastes extra special. And delicious. Serving it open-face is a way to cut out some carbs and calories. Plus, it’s pretty! This recipe is perfect for nights when you need dinner in a flash and you don’t have a plan. Start to finish, you’re looking at about 20-25 minutes. It’s one of our Quick and Easy Recipes. The first step is to make a warm dip by softening the celery and onion in a skillet and then blending together cream cheese and mayonnaise, followed by tuna fish. Don’t stop there and sit down for a taste! Is it just me? I could sit down with some chips and vegetable dippers and call it a night! The next step is to spread the tuna dip over your favorite bread, top it with sliced tomato and more cheese and then broil! That’s it! Serve open face on an English muffin or in a croissant. Leave off the parsley garnish (a.k.a the green stuff) if you have picky eaters in the house. Green onion is a nice alternative to white onion. Top with cooked bacon and then broil. If the bread is sliced thin, then toast it lightly first. Shave a little time off the total cooking time by using tuna that comes in pouches. It makes the prep even easier – just tear open the package. No draining involved. 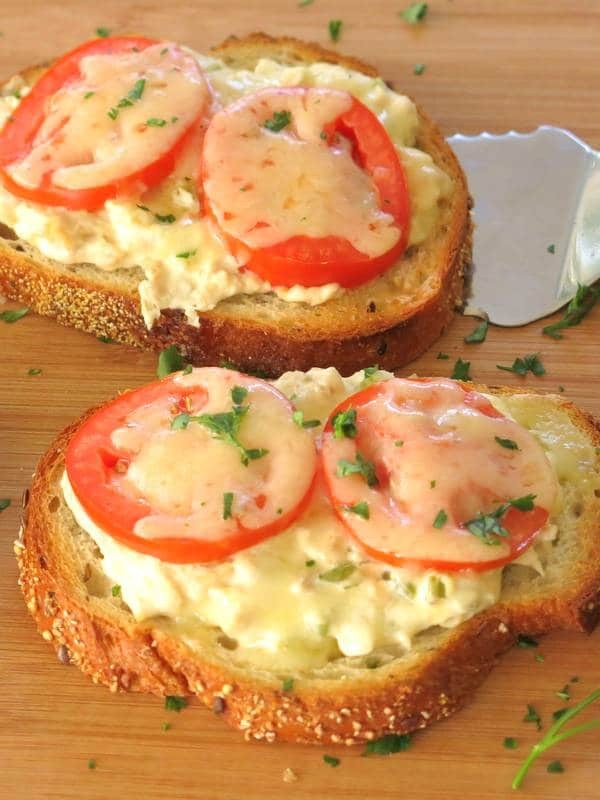 Creamy open-faced tuna melts are sure to make you smile at the end of a long day! Please rate this recipe and if you make it, tag @DinnerMom or #DinnerMom on social media. We love to see what you are cooking up. Creamy, cheesy tuna "dip" is slathered on whole grain bread and topped with fresh tomatoes and cheese. It's a quick and easy comfort dish! Add celery and onion to pan and saute for about 3-5 minutes or until softened. Add cream cheese, mayonnaise and garlic powder to pan. Stir to melt and combine ingredients. Stir in tuna and remove from heat. To assemble sandwiches, divide tuna mixture between slices of bread and spread in an even layer. Place tomato slices on top of the tuna. Sprinkle cheese over the top of the tomato. Place sandwiches on a broiler pan and place in the oven for about 2 minutes or until the cheese begins to melt. If desired, toast bread lightly before assembly. These look fantastic! Can’t wait to try for lunch or dinner. Love it! I’m a big, BIG fan of tuna sandwiches. A creamy open faced one sounds absolutely divine! Good job! Live your ingredients and photography! I love tuna melts and so cool that you did them open faced! That looks delicious! I love BumbleBee tuna! Thanks Brenda! Love the pouches! We’re big fans of the tuna in pouches – it’s so much better than the canned stuff! I also love to bring it to work with me to throw on top of salad. It makes things verrry easy! I love a good tuna melt – it’s been way too long since I’ve had one. I love your photos and the open face presentation! I love a good tuna melt! Looks yummy! Love this! Easy and simple! Doesn’t get much better than that! Tuna melts are one of my all time best loved comfort foods. These look so good!! I’ll be making these for my husband soon! These are absolutely incredible. My hubby would love these. Now you’ve got me wondering if I could do something like this with salmon. Absolutely! And with crab too! I am aaaaaalll over these! I love tuna melts! Your open face sandwich photos are fantastic! Does the calorie count include the whole wheat bread? Is a low calorie wheat bread? Hi! The nutritional estimate includes whole wheat bread. I’m not a huge fan of tuna, but had a can in the pantry and made this. It’s really good, like a dip, but on bread. The family loved it.